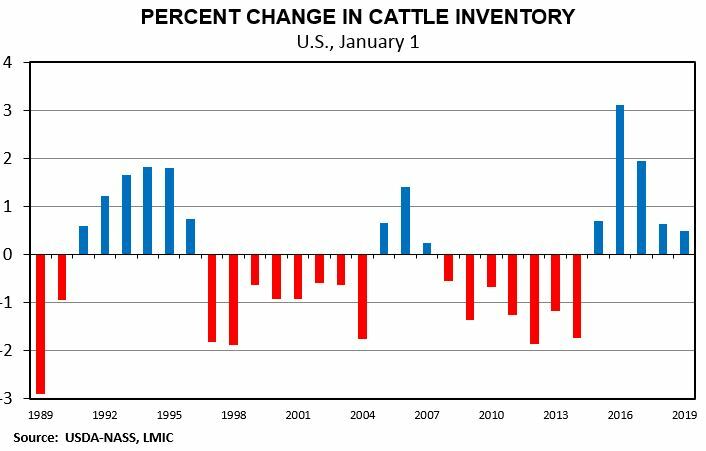 The USDA Cattle report was released last week and it showed an estimated 0.5 percent growth in all cattle and calves for a total of 94.8 million head in the U.S. on January 1, 2019. The U.S. calf crop estimate of 36.4 million head showed 644,500 (1.8%) more calves were born in 2018 than in 2017 which marked the fourth consecutive year of calf crop increases. This report was mostly the expected mix of slight growth and hints of lower growth in the future. A larger calf crop in 2018 implies beef production will again be higher in 2019 and likely into 2020 but the cow and heifer numbers point toward smaller increases in calf crops in the future. The inventory of beef cows was 31.8 million head which was up about one percent. However, the number of beef replacement heifers was down 3 percent from January 1, 2018 at 5.9 million head. This left beef replacement heifers at 18.7 percent of the total beef cow herd which is the lowest level since 2013, but still above herd contraction levels. Only 4 of the top 25 states showed year-over-year increases in the number of heifers for beef replacement. It is likely that we are near the end of the herd growth phase of the cattle cycle though it is worth noting there is not yet clear evidence of entering a contraction phase as calf prices remain at profitable levels. A shift higher in prices could push more expansion while lower prices in 2019 could lead to contraction. A look at the state-level estimates shows the majority of growth in the beef cow herd can be attributed to three states: Texas (+135,000), South Dakota (+67,000), and Oklahoma (+62,000). Combined, these three states saw beef cow herd growth of 264,000 head and were major contributors to the U.S. beef cow herd growth of 299,500 head. One difference between these three states is that South Dakota and Oklahoma have surpassed their 2010 beef cow inventory levels while Texas is about 485,000 head lower. Texas (-9.4%), Montana (-1.2%) and Kentucky (-5%) are the only states in the top 10 of beef cow inventory with lower cow herds than in 2010. These inventory responses generally align with market performance over the past two years: prices have been strong enough for nearly flat or slow expansion but not high enough for the rapid expansion seen just a few years ago. We are not yet talking about herd contraction, but we are unlikely to see large calf crop increases the next few years without a large and sustained price rally.